This year marks the 40th anniversary of China’s reforms and opening up, the country has transformed itself from a largely agricultural nation into the second largest economy in the world. For decades, Hong Kong industrialists have been the active contributors to the Mainland China’s development. At the same time, the country’s reform is a key impetus for Hong Kong as it propelled the city’s industrial and economic development. As our country steps into a “new era” of development, Hong Kong should renew its mission to play a new role, seize the opportunities arising from the Belt and Road Initiative and Bay Area development and integrate into the overall development of our Country. To bring together the business sector and members of public to celebrate this milestone, CMA will organise a series of celebration events to demonstrate the splendid course, great accomplishments and precious practices of the 40 years of reform and opening up. Every Sunday, 11:00 p.m. to 11:30 p.m. The programme is a good opportunity for the general public to enrich their knowledge of the country’s development process and its achievements over the past four decades. Please stay tuned! Jointly published by CMA and Hong Kong Economic Times, the book aims to document the journey of Hong Kong industrialists’ participation in Mainland China’s transformation and to take a forward-looking perspective to analyse the development approach of Hong Kong industries. The book interviews a number of Hong Kong industrialists and entrepreneurs who were pioneers to set up factories in the Mainland. They tell us how they seize the opportunities arising from the nation’s development and keep up with the trends to remain competitive. The book is available at bookstores. Over the past 40 years, Hong Kong industrialists have been actively participating in national development and sharing prosperity with the country. At the High-level Luncheon on the 40th Anniversary of China’s Reform and Opening Up organised by CMA, senior government officials and business leaders came together to review the course of Hong Kong industrialists’ participation in the remarkable journey of our country and explore the potential opportunities ahead. The high-level luncheon on the 40th Anniversary of China’s reform and opening up was the finale to the series of commemorative events held by the CMA to “celebrate 40 years of national reform and opening up.” Over 200 government officials, prominent industrialists, and scholars participated in the luncheon. The officiating guests included Vice Chairman of the CPPCC, The Hon CY Leung; Chief Secretary for Administration, The Hon Matthew Cheung; Deputy Director of the Liaison Office of the Central People’s Government in the HKSAR, Mr. Tan Tieniu; Deputy Commissioner of the Office of the Commissioner of the Ministry of Foreign Affairs of the People’s Republic of China in the HKSAR, Mr. Song Ru’an; President of the CMA, Dr Dennis Ng; Deputy Chief Executive of the supporting organisation Bank of China (Hong Kong), Mr. Yuan Shu; and Managing Director and Executive Director of Hong Kong Economic Times, Mr. Perry Mak. The CMA also held the launching ceremony for Pioneers of China’s Reform and Opening Up, a book jointly published by the CMA and the Hong Kong Economic Times. 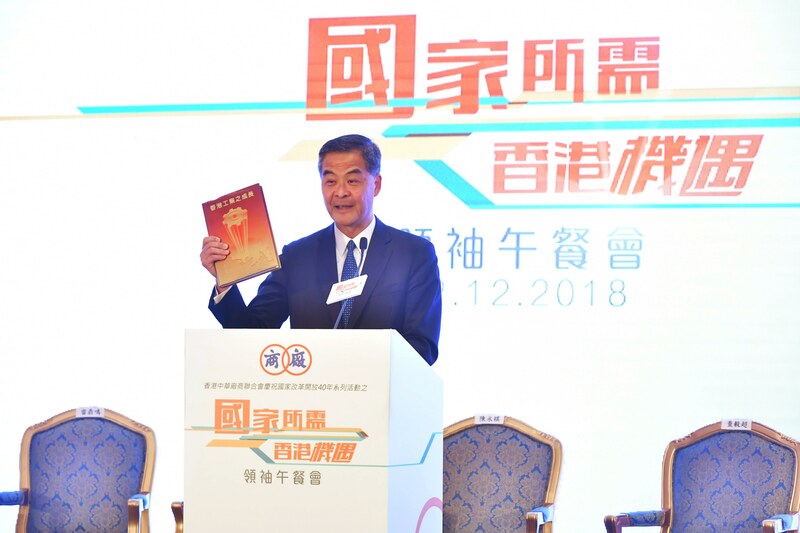 In his keynote address, The Hon CY Leung said, “If you can make things better for one day, you should make them better every day and never stop doing it.” He recalled that in the early days of reform and opening up when he went to the mainland to give lectures and talks, he saw many Hong Kong manufacturers using red-white-blue bags to carry raw materials and semi-finished products to Shenzhen for further processing. They seized the opportunity for national development and gradually shifted production lines to the mainland to reduce costs and expand production scale, thus moving towards a larger market. Mr Leung said the red-white-blue bag can symbolise the Hong Kong Spirit, that is, the courage of looking beyond Hong Kong for new opportunities arising from the reform and opening up. 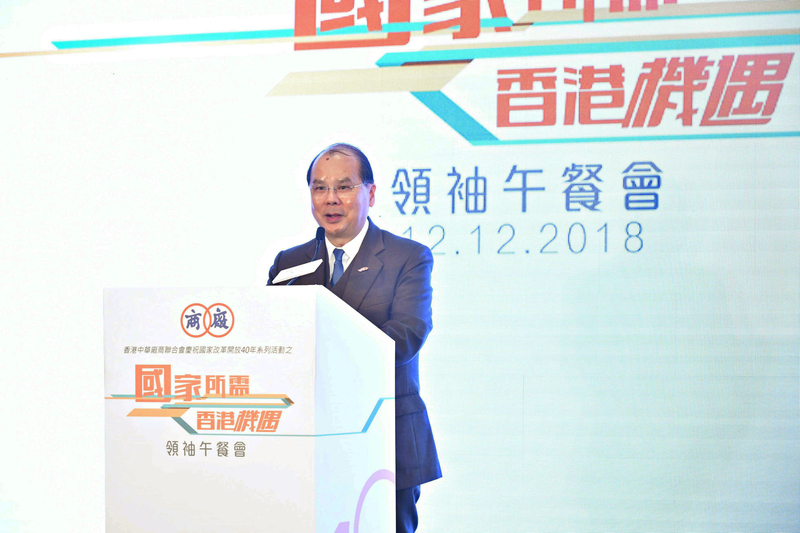 Mr Leung said that many Hong Kong manufacturers have successfully transformed and upgraded in the Mainland, introducing new industries to Hong Kong and even creating a new economic situation. Mr Leung praised Hong Kong manufacturers for their outstanding contribution to national development and they should be proud of their efforts. Mr Leung said that every generation of industrialists faces a variety of difficulties and obstacles but he encouraged the industry to remain positive. He believes that Hong Kong enterprises will enjoy a more welcoming business environment in the Mainland as the country continues to develop. The Guangdong-Hong Kong-Macau Greater Bay Area could become the one-day business radius for Hong Kong entrepreneurs. The Belt and Road Initiative is another great opportunity for Hong Kong corporations to “go global”. He encouraged Hong Kong people to seize these unique opportunities and enter the global market. The Chief Secretary for Administration, The Hon Matthew Cheung, also acknowledged the contribution of Hong Kong enterprises to national development. “When Hong Kong enterprises invested in the mainland at that time, they spearheaded the reform of the national foreign trade system and have created many employment opportunities. Currently, Hong Kong remains the largest source of foreign direct investment in the Mainland.” While serving the country, Hong Kong has also transformed into a global financial, transportation and trade center. Hong Kong has been ranked as the world’s freest economy and among the most competitive regions in multiple international surveys. Mr Cheung said that national economic development has entered a new era. “China is committed to increasing bilateral investments and trade with the rest of the world. This provides another historic development opportunity for Hong Kong enterprises.” He encouraged Hong Kong enterprises to make the best use of their unique advantages in national development for greater business opportunities. The luncheon featured a panel discussion themed “Retrospect and Prospect of China’s reform and opening up”. It was moderated by the Permanent Honorary President of the CMA and the Hong Kong Deputy of the National People’s Congress (NPC), Dr David Wong. Six distinguished industrial and business leaders, economists and academics shared their experiences in participation in the country’s transformation. They also exchanged views on how Hong Kong should be integrated into the overall national development and fostering of new areas of economic growth. The Permanent Honorary President of the CMA and the former CPPCC Standing Committee member, The Hon Chan Wing Kee, was one of the pioneers to invest in the Mainland. He recalled that it normally took days to go to his factory in the Mainland due to the underdeveloped transport system back then. It was also not easy to make a long-distance call. Looking back, these painful experiences have become good memories. Honorary Chairman of Beijing Air Catering, Dr Annie Wu, also pointed out that she encountered various difficulties in the early days of business development in the Mainland, but all of them were overcome by the Hong Kong spirit and perseverance. Looking forward to future national development, they said that they would continue to explore new markets with a pioneering spirit, and are planning to invest in Africa to grasp Belt and Road opportunities. Mr Chan is setting up a factory in Ethiopia, while Dr Wu was recently appointed as the Honorary Consul of Tanzania. She aims to establish an industrial park for Hong Kong enterprises to help them expand the European market. 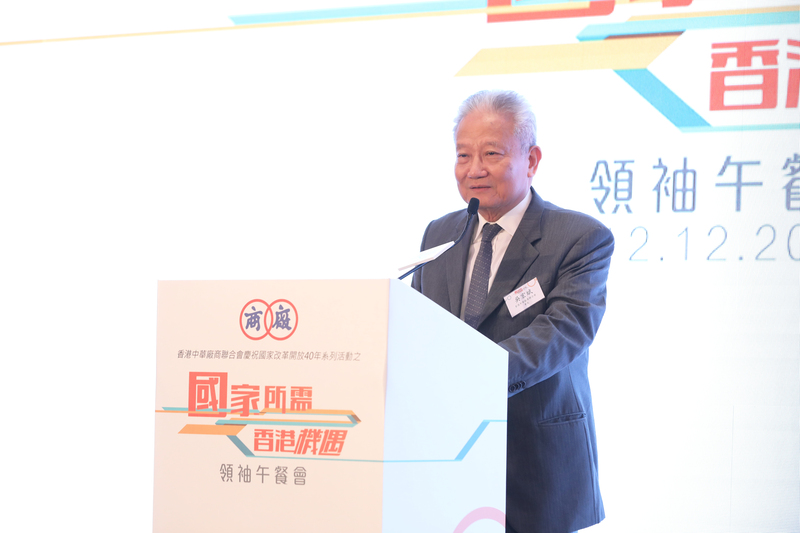 The former Head of the Department of Economics and Adjunct Professor of HKUST, Professor Francis Lui, summarised Hong Kong manufacturers’ contribution to the country. He said the business model that Hong Kong entrepreneurs brought into the Pearl River Delta not only laid a solid foundation for the country to become the “World’s factory”, but also have a widespread impact on other countries. “This “Hong Kong DNA” has been preserved by Mainland manufacturers and they then introduced it to the Belt and Road countries like Poland and Africa. Hong Kong manufacturers should really be proud of themselves,” he said. Dr Tse Kwok Leung, Head of Economics and Policy Research of the Bank of China (Hong Kong), believes that the economic cooperation mode of “front shop, back factory” between Hong Kong and the Pearl River Delta region will be changed due to the establishment of the Greater Bay Area. Hong Kong can leverage its unique strengths as the international finance, transportation, and logistics center, and partners with other cities to create much stronger advantages and establish an even more sophisticated ecosystem of supply chains for the area. In the new wave of reform and opening up of the country, Hong Kong’s pivotal role has not been diminished in the process. President Xi supported Hong Kong to become an international innovation and technology center. Mr Shang Hai Long, Managing Director of SenseTime Hong Kong, a Hong Kong-based company being praised as the city’s first hi-tech unicorn, said that Hong Kong’s universities have cultivated a pool of high-quality international professionals. Its robust research performance has the ability to transform Hong Kong into an international innovation and technology hub. He believes that Hong Kong should be more determined and confident on the road of re-industrialisation, especially over the next two years. He quoted the late Deng Xiaoping: “Science and technology are primary productive forces”. He said the HKSAR government should increase investment in nurturing more local technology talents to prepare the city for success in the technological future and to achieve economic transformation. Dr Sunny Chai, Board Chairman of Hong Kong Science and Technology Parks Corporation indicated that the scope of technological development in Hong Kong is similar to that of the Greater Bay Area, and there is much room for cooperation. He suggested to strengthen the division of work and cooperation among the cities in area to complement one another. He further noted that Hong Kong manufacturers in various sectors have recently indicated their intention to relocate their production line back to Hong Kong. Thus, moving towards re-industrialisation is no longer just a conceptual idea but a mission that has to be realised through immediate actions. The government has invested nearly HK$100 billion in innovation and technology over two terms. Dr Chai described this as a golden opportunity to optimise the industrial ecosystem. He recommended the industry to make good use of the latest funds and resources from the government to improve their technologies for transformation and upgrading.